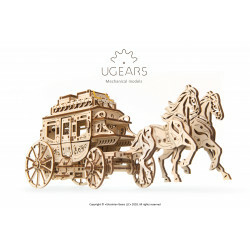 Throughout the history Ireland has been a pioneering country in using the power of the wind to create energy. 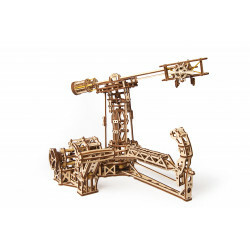 The earliest tidal windmill so far discovered in Europe was built in 619-21 for an early Christian monastery. 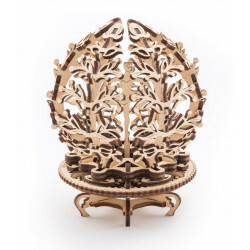 It was excavated at Nendrum, Northern Ireland. Nowadays 23% of Ireland’s average electricity demand is generated by wind turbines; it is one of the highest values in the world. 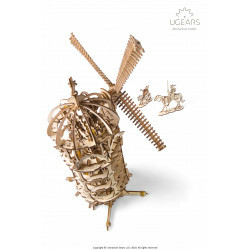 The new UGEARS model Tower Windmill contributes to the legacy of alternative energy sources and presents us with a unique opportunity to show our children the principles of how the windmills actually work. 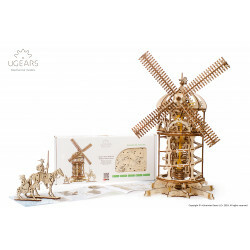 This kit features a large and moving windmill, and two figurines. 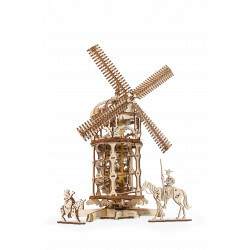 The model is inspired by the earliest tower windmill in England and is powered by a removable rubber band motor. 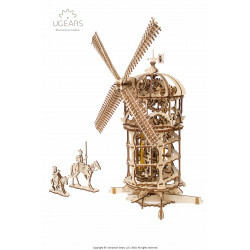 Once the motor is taken out, it is possible to operate the Windmill in a manual mode allowing one to watch the moving gears and get fascinated with the model’s elaborate mechanism. 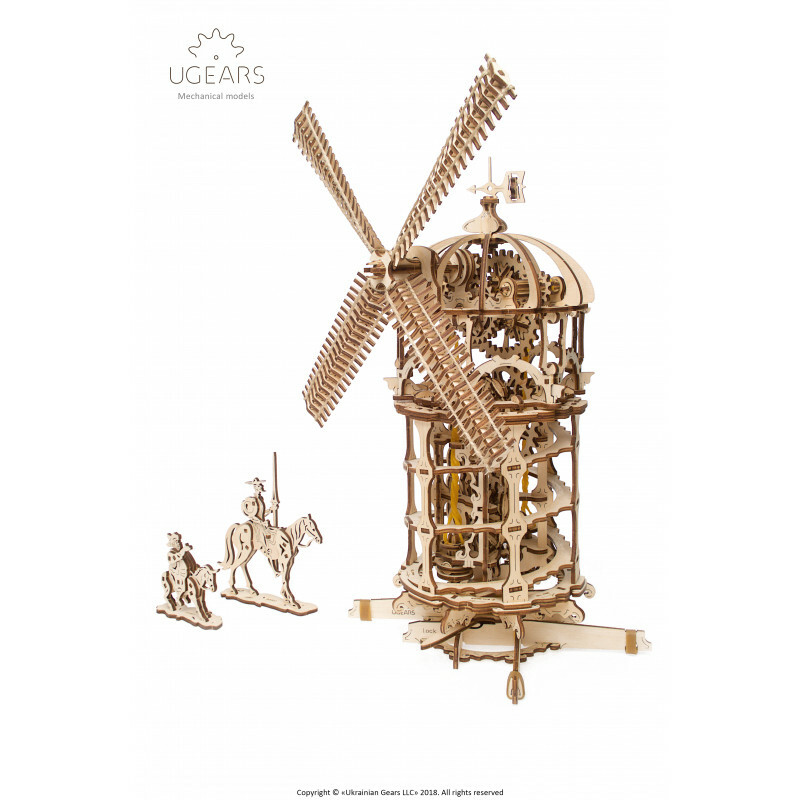 To make the Windmill move one needs to wind-up the cage section fully about 15 times and then operating the release switch, set it loose. 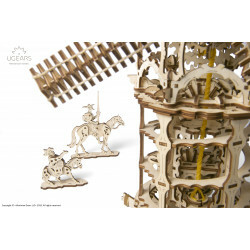 Both the the windmill blades and the cage section can rotate. 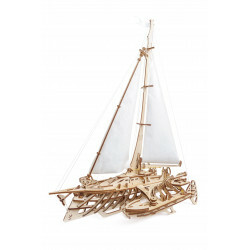 When spinning fast the sails can create quite a strong wind. 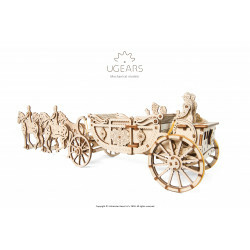 It also works the other way around: blowing air at the sails will make them spin. 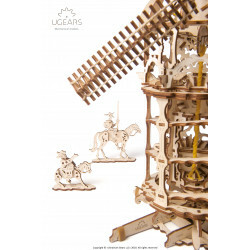 While being based on the English prototype, the Ugears model also addresses the Spanish classic: the Tower Windmill comes with the figures of Don Quixote and his Sancho Panza, and strangely enough has another Irish connection, as the very first English translation of the Don Quixote was produced by a Dublin-born author Thomas Shelton in 1608.